Astral Dreamer is a 3 PCM wave oscillators synthesizer. There are dedicated routing options starting right at the oscillators which can be routed to one of the two filters, a flanger, or direct to the VCA. So you can have a dedicated soundmodifier for each oscillator allowing a wide variety of multicoloured sounds within a single patch very much like multilayered sounds. Each oscillator has got an Additional Harmonics Shaper (AHS) to enrich sound in generating shapeable upper harmonics from the selected wave. The character of this additional sound ranges from rich choruslike to metallic sounds and can be mixed – also via modulation – to the original wave. 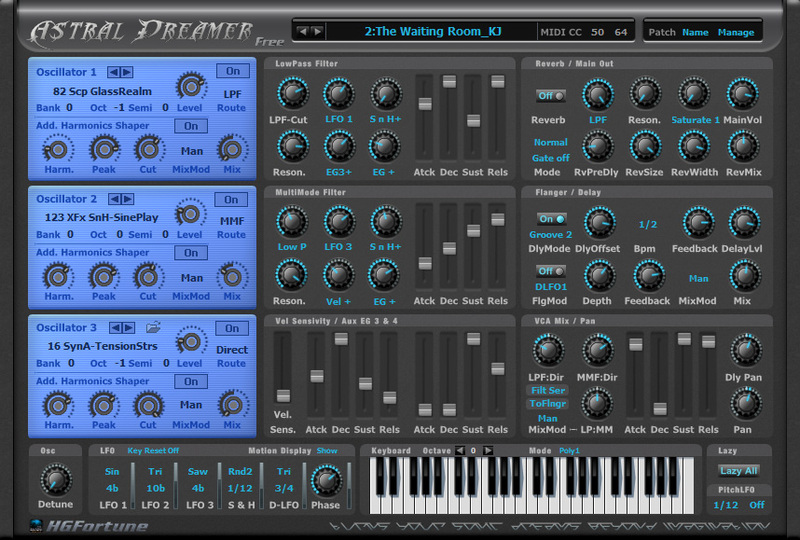 The new waveset coming with Astral Dreamer does contain carefully processed waves to provide a wide variety of soundsources: Synth waves from real analog, virtual analog and digital synths, complex waveforms, soundscapes (mostly image generated sounds), plus some XFx sounds. Besides the routing possibilities there are a lot of modulation options to shape the sound into some intricate motion. And the straightforward GUI provides instant access to all controls for quick editing and tweaking to shape your sound. 3 PCM wave Oscillators each with 128 waves plus Additional Harmonics Shaper. 1 24 dB resonant Lowpass filter with ADSR EG and 4 channel mod mixer. 1 12 dB resonant Lo, Hi or Bandpass filter with ADSR EG and 4 channel mod mixer. Filter Routing: parallel or serial possible. 2 Aux ADSR EG (3 & 4). 1 bpm synced Sample & Hold. 1 bpm synced double LFO with phase shifting. 1 Pan for direct signal. 1 Pan for delay signal. visual display of LFO motion (can be hidden). MIDI Learn/CC Edit for most control elements.